Have any of you heard any info on drilling out the H.P. intake port on a Toy box when using a Saginaw box. I heard this may stop squeeling because the Toy box restricts the flow from the Sawginaw pump. What are you trying to say? Can you elaborate on what set up you have and what you are talking about? I had the same issue happen with with the resrictor. When trying to punch out the restrictor I ended up knocking a hole between the two holes. Left it that way and it ran fine. This was on a 1992 box. I will try to take a picture of what I am talking about in a day or two. You want to drill out the intake port on a Toyota steering box or Saginaw box? What pump are you running? Saginaw pump? I don't know anything about b*std setups using GM parts. I am curious at how much more flow a saginaw pump would provide and how the heck you would get that huge thing mounted on a toy engine unless you have a 4.3L. Ya i knocked the whole peice out. Did you drill it out after that? Thats what im going to do. I could not get the restrictor to fall out so that I could drill it. In trying to tap it out I ended up punching through just between the two holes. A little piece between the two holes cracked out. The two holes became one in a not so round pattern. I did not drill it out as that would have just made too big of a hole. I ran it figuring that if it did not work I would just by a new piece. Have not had any issues. I have a 4.3L vortec in my 82 truck with Sawginaw pump. BTW this is a different truck than the one I am talking about with Yota4life. Anyways... My 82 will get a Toy box when I do my histeer. I have read a thread on pirate about a guy that was running a Saginaw pump and Toy box that had some squeeling that he could not get rid of no matter what he did. A shop had told him that the pump was putting out more flow than the box was designed to flow at with the O.E. pump. He ended up drilling a larger hole on the intake (H.P.) side of the box. Just where the fitting screws down onto. He says the squeeling went away. What I am asking is if anyone else has heard of this mod and how it worked or did not work. so does anyone know of online instructions on how to rebuild the steering box? with good pics? i am about ready to throw this pos out the door. Anyone have any pointers on putting the 44 little ball bearing back in? After spending 4 hours rebuilding the box i now need to reasemble it. Any help? I can't remember right off hand, but I think I installed them through that little"tube". I have another box thats apart. If I get time today I'll try and figure it out for ya! Oh no! Those things are a sumbitch. Was it necessary to take the piece that holds the balls apart? I predict your box will fail unless you get those things back in perfect. No i didnt mean to but i was rebuilding it so i was moving it around and it just unthreaded a little and they started to fall out. I know about the little tube your talking about Tice. Note to anyone reading this. It is a major PITA to rebuild one of these boxes. I dont even know if i can get it back together right. The boxes are really simple and easy to do unless you unscrew the gear and the balls fall out. Follow the instructions Freds40 took the time to post for everybody and you will have no problems. Freds40 listed how to remove the gear assembly without the balls falling out. I have done a few of these now and I think I could have it all done and back together in under an hour easily. Ok, so after reading all this I'm still not clear- way back when I took apart my old gear box and damn if those balls didn't go flying- but I took out the steering shaft first, and never even got the sector shaft out. It was confusing the hell out of me to see what freds40 was getting out because it didn't look anything like what I had seen before. Now I am thinking that when I took out the steering shaft first, I inadvertantly dissassembled the whole whole steering shaft thing and the balls spilled out of the guts (used grease as mentioned before to line the internal worm gear then thread the actual steering shaft back in to fix it) and it seemed to work ok. However, if I'm reading this right and follow freds40's instructions removing sector shaft first, that will permit the WHOLE steering gear part to come out and the internals with the balls will not be exposed unless that little tube I saw on freds40's pictures comes loose then you just reload through the tube? I was starting to think there were two different kinds of gear boxes and I ended up with the sucky one. I would have to go back and re-read but as long as the box was all the way to the left I believe the entire piston assembly should just pull out. Do not thread the shaft out. I don't know, it sure wasn't that complicated as long as you follow the directions and the order of disassembly. I have done it on a 1986 and 1992 box with ease. I have a quick question for you guys. I have all of the tools needed but I am trying to find the correct size tap to use for the steering box. I picked up a 1/4" tap and it just seems way to small. The drill bit with it is 13/64ths. I though you were supposed to drill the hole out with 7/16. A 1/4 tap would be too small. So my question is, what size tap should I use or am I just picking up the wrong size tap from the hardware store? The Tap must be 1/4 NPT. Ask the hardware store for a 1/4" NPT (national pipe thread) tap. It is roughly3/8-1/2" in diameter. if you keep it to the left, it will keep them in, i was cleaning mine and turn it to the right and spilled mine. feeding them back into the 2 piece tube was the only way i found to get them back in. been on several rides and it works great except for a little pump roar. this is really gonna show my mad fabrication skillz Is it better to use a drill with npt threads, or better by hand? I know it is mentioned that a drill was used earlier in the thread, but didn't know if thats a fast way or better way??? I just did it ... no drill for me I started the tap with my fingers then used a wrench for some leverage to cut the threads in deep. I would be afraid of getting the tap in crooked with a drill. Thats what I am afraid of. Thanks for the quick replys. i can't wait to be able to turn again! I took care of it last night. Everything was as described. I would say you will want a vise. Also had a buddy show me how to avoid drilling too deep. Since you can see the depth of the vein you are drilling you take the bit and put a piece of tape at the point where you want to stop. takes out the guesswork. very little chance of drilling to deep that way. As far as road manners. I think it feels like a lincoln or caddy from the late 70s early 80s. Felt great to me! just wanted to say thanks. i just walked in from my garage after completing my ha. pretty excited. i dont think i would have even thought of doing it if i didnt read this. it was real easy. hello... i have hydro assist and the steering has alot of "play" where you can wiggle the steering wheel and it wont turn. but then my tires grab the road and try to steer away so its dangerous to try to oversteer and gain control... i just had a question of how if possible to adjust the steering to make it more sensitive? thanks for any info. did you drill out the restrictor? Did you center your ram before welding on the brackets? Not sure if that would be the issue. May want to wait for a more informed responder. I can also turn my wheel back and forth slightly without much response, however it is very predictable in when it will respond, and doesn't make any sudden moves. The only other guess is if you still have push pull steering. 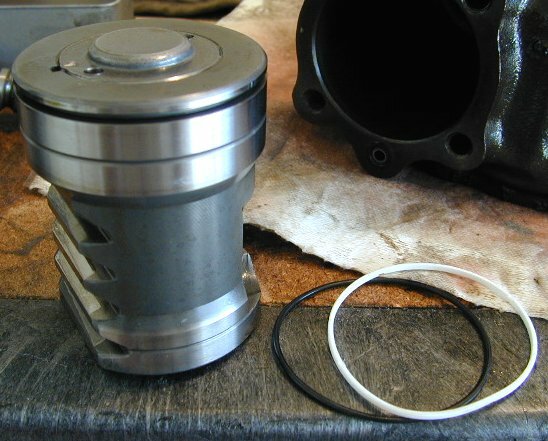 anybody know where I can get the rubber and teflon Orings that go on the "piston" of the input shaft? I just cut mine re-assembling the dang box. need help fast. any trick to getting it back in w/o cutting the rings? I would locate this hole closer to the steering shaft if possible if I were doing it again. I would have to look at it to see if it is possible. I ended up lossening the fitting with my tire. Note this was not a problem when the axle was 2" forward. Now it only happens at full stuff, wheels turned passenger. here you can clearly see the vain. and what I did to help me not drill pass that. I used tape to mark my drill bit and measured from the side to get me how far I would need to go. About 1/2" is all that you need. On the second location I drilled on the side of the box....but, instead of 1.25" . I marked and drilled 1" from the seam. If you look inside your box where you are going to drill....you will see that the casting gets a little thinner passing that 1.25" and beyond. Here is your sector shaft God I hope I have this right. this is my finding and I hope that helps some. Took me the whole day to remove box from truck to installing it back along with the hydro assist set-up...including parts run(mig wire),breakfast and lunch. I have a huge cooler so no mods where made to the resivour....for now. There is an O-ring that slips onto the end cover at the top of the diagram. I rebuilt my steering box at the time i tapped it for hydro assist. I used the oring that came in the kit and i was getting a bad leak from the top. So i smashed a bigger O-ring in there and it worked for 2 trips till it blew it out. So i put the original one back in and its leaking bad again. What could i do? I tryed kragen and napa to see if i could find a 0-ring that was the same size but thicker but no luck. Maybe i have to get a new box or something.... Is there any silicone that would seal that pressure in there and stop the leak?